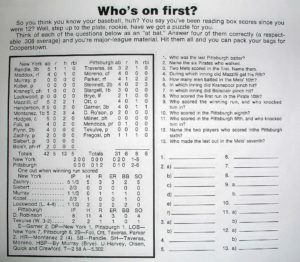 Question #3 – Name the two Mets who scored in the first inning. Answer – Randle scored on a hit by Mazzilli. Mazilli scored later in the inning on the only hit by Montanez that was not a HR. (Montanez has 2 HRs, a 2 run shot in the 8th off of Robinson, the only other inning the Mets scored twice, and a solo shot in the 10th off of Tekulve).